Looks like these fellas have owned this wall for a generation or two. You can see the faded ad on the bottom half of the wall, as well. A really well preserved wall considering it’s open to the weather. 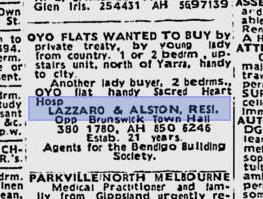 I couldn’t find much about Lazzaro & Alston with a google search, but it did turn up a few classified ads from The Age newspaper. 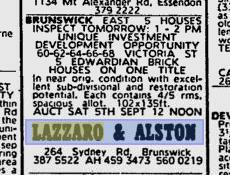 That bottom ad is from the August 11, 1976 edition of The Age, putting the established date of the company at 1955. The latest article I can find is from 1987, so all in all, not a bad innings for old Lazzaro & Alston! The company was based across the road from the Brunswick Town Hall in a building now occupied by the Brunswick Dental Group, (with the head dentist being Dr. Yap … I’m not even kidding.) I’ve had a good look at the building but unfortunately there’s nothing I can see on the outside from the old estate agents at all. FUN FACT: Going by the after hours numbers in those two ads, it seems like the guys moved from Templestowe, out to the leafy suburbs of Heidleberg and Wheelers Hill. 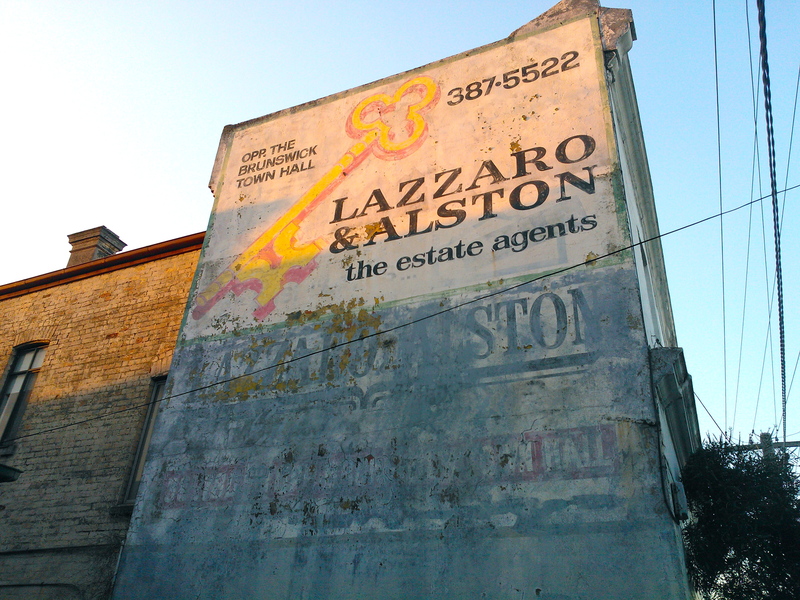 Tags: Estate Agent, Lazzaro & Alston. Bookmark the permalink. You know what I like. ‘Opp the brunswick town hall’. This is an important fact to tell people. In case they accidentally turn their heads 90 degrees right and are unable to identify the enormous, but strangely unidentifiable civic building that will hove into view. Also good for those that are lost. Wow, came across this post. John Lazzaro was my father who started the business and retired in 1992, being bought out, aged 71. He had a number of other prominent signs around Brunswick. I have many fond memories of the “office”. And yes, the family moved from Pascoe Vale South to Lower Templestowe in 1975.